OK….I have a question. If you have a driver’s license that lists your weight and height, are they accurate? If not, are they off by 10%, 20%, Yikes! 30% or more??? If so, join the club. Supposedly, most women lie about their weight and men lie about their height. Not all states require the weight part, but I wonder why we have such an important document that we feel the need to avoid the truth?!! Do you think that when other people look at our license that they check the weight or height and then snicker to themselves? Obviously, it’s not important to DMV because I’ve never had to “weigh in” for them. Have you? Oh the horror, right?!! What I find interesting about the weight part is that we know we need to lose weight, but feel the need to avoid dealing with it even when it comes to being a responsible and honest, license-carrying citizen. I wonder if we had to weigh in at the DMV when we renewed our license if we would even avoid renewing it….kind of like we do when we need to go to the doctor. How many of you have tried to make great effort to lose a pound or more the week or two before your doctor’s appointment? I’m raising my hand because I’ve sure been there. I even try to find the very lightest weight clothing sometimes….no heavy jeans or boots are on my body when I step on that scale!! Let’s get honest….. I went through years of professing my weight (the one of my choosing) to DMV or anyone else that asked, knowing that it was a huge exaggeration. I knew I needed to lose weight and get healthy, but I continued to live in the fiction world. Why did I wait so long to do anything about it?? I still can’t answer that question. I guess we all have to “hit that wall” that makes us “look in the mirror” to make changes in our lives. I am very thankful that I found info about the Paleo lifestyle this year. I can say honestly that I am finally at the weight that I have proclaimed for years and less than I have weighed in at least 15 years or more. What ‘clicked’ I wonder? What makes us throw those bad habits out the window? It is really intriguing to me to see someone seem to change, literally, overnight. They do all the things that are wrong for them and then suddenly, one day, all the “lessons” they have been given miraculously make sense. I wonder if it is something cosmic-like…..if all the stars are aligned in a certain manner and we “receive” information…that info suddenly will get absorbed??!! Any scientist out there that can answer that question? I have a bunch of other issues to work on too, so maybe I could start planning for that cosmic-alignment moment now. How close are you to your DMV weight? And, yes, what do you have on your “list” that you have not ever checked off? 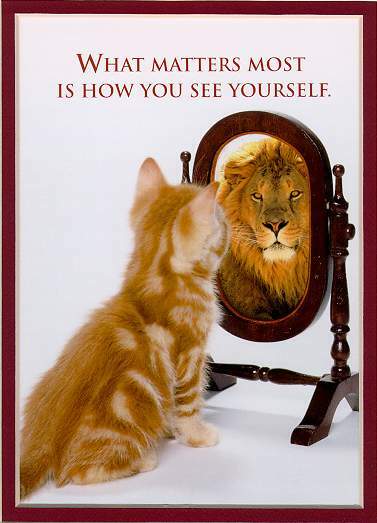 I wonder what is going to have to happen in your life to get you to “look in the mirror” and see the reality. How about changing your mantra to “I Matter” or “I care about myself” or even “I love myself”. It is amazing to me to talk to people who are not able to say this to themselves…..AND they don’t know that others care about them either. So today…..I’m saying it for you. I’m going to tell you the truth because I care. YOU MATTER…..YOU ARE A GOOD PERSON…..YOU CAN MAKE A DIFFERENCE BY BEING THE BEST PERSON YOU CAN BE!! Are you ready to start? Repeat after me…. I Matter. I Matter. I Matter. Now, take the next step and make changes. What do you see in the mirror? do anything you want to do…..starting today…now!! About four months ago, I came across a blog post that was written by a doctor in Louisiana (http://paleolithicmd.com/) and he was talking about a way of eating and cooking that I had never heard about before. It’s called a Paleo diet, derived from the Paleolithic era that ended about 10,000 years ago (http://en.wikipedia.org/wiki/Paleolithic). I was curious of what it included and was drawn in by his vivid pictures of what he was cooking for his family for that day. Yummy! for sure. As I read more, I became more intrigued (particularly since he was a medical doctor) about information he was sharing about some of his patients that he had encouraged to try the Paleo way of eating. The main draw was that these patients were drastically reducing their cholesterol levels, but eating many of the things that my own doctor had just told me to avoid because of my elevated levels. He was also telling me NOT to eat foods that I had been encouraged to eat. I, personally, have ALWAYS had high cholesterol and despite eating very low-fat diets, the numbers just didn’t change much. In fact, my own doctor told me that it was unlikely that I could decrease the numbers significantly without the help of medication. I have always been consoled by the fact that my grandmother who lived to be 96 also had very high cholesterol and it didn’t seem to shorten or interfere with her active lifestyle. She defied doctors and ate eggs and sausage or bacon almost every morning of her life. At one point, her cholesterol levels neared 400!! ….but never seemed to affect her….or slow her down!! The Paleo diet is often referred to as the cave man(woman) diet. It comes from a society of hunter-gatherers whose diet consisted of mostly vegetables and berries and subsidized by any game they were able to capture. It does not include any grains, dairy, legumes or sugar and any meat or fish consumed should be cream of the crop, grass-fed, free range and lean but…included in every meal. No canned or processed foods at all if possible and organic vegetables are preferred. You’re already “putting on the brakes”, right? I have to admit that I kind of had the same resistance, but once I started the process, I found that I just didn’t miss some of the things I had to eliminate from my daily fare. But….let me give you these facts first, so you can perhaps have some motivation to try it…. This diet lifestyle is not for everyone and I couldn’t be certain that it is the best choice for you based on your own health issues and circumstances. I just know it REALLY worked for me. The part I have enjoyed most is that I have lost weight easily and I feel so much better. Giving up the grains often eliminates any inflammation including arthritis symptoms. People with fibromyalgia also experience great results with this way of eating. It really balances the glycemic levels and keeps me from craving the sweets. Diabetics that have tried it, either no longer need insulin or drastically reduce their dosage. I don’t count calories or portion sizes. I do keep my meat portions under 8 oz and remove as much of the fat as possible, but I probably eat close to 2000 calories a day!! I was surprised to learn that Nell Stephenson (paleoista.com) who wrote the book “The Paleoista” and co-authored “The Paleo Diet Cookbook” with Dr. Loren Cordain, lives here in Los Angeles. I would LOVE to have some one-on-one time with her to fully understand how this diet works…and why it works or maybe participate in some of the classes she offers!! She offers great recipes and they are really easy and quick to prepare too. I know this is Hollywood and there is a new diet trend just about every week, but this one is more of a lifestyle choice than a diet. And more than that I have the facts to prove its benefits AND I feel really good. So today is a little different kind of Monday….not my usual motivational time for sure; but hope you enjoyed it just the same. me to do all the things I want to do. I hope you try to take good care of yourself too. There’s always room for improvement when it comes to your health. But more important than anything. Please believe that you are worth it!! You Matter! Lots and Lots! Have a very Healthy and Happy Monday! And thank you Dr. Garcia and Nell Stephenson, you have changed my life.